The CFA Institute had started conducting the Level 1 exams twice a year from 2003, and since then it has been noticed that there are as many candidates for the June attempt as there are for the December attempt. CFA level 1 exam has picked up speed and is now widespread, being taken by thousands of candidates per year. The June and December sessions have attracted more candidates and hold similar yet different pass rates and candidates enrolment. The CFA level 1 exam conducted in June had witnessed a rising trend from 2010 to 2012 where it was at the peak and then falling down. The enrolment has significantly increased from earlier times and seems to keep increasing. The number of candidates appearing for June Level 1 is almost the same as the number of enrolment before the CFA Institute held two exam sessions per year. 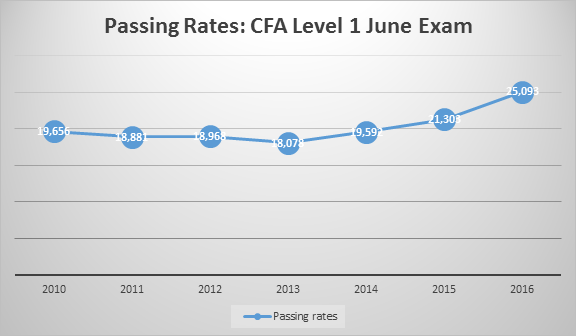 The CFA pass rates for level 1 exams held in June have seen a somewhat constant rate shifting by 1-2 %. It has declined since the olden times but that can be justified with the fact that there are higher numbers of candidates taking these exams now. Candidates are striving to clear the first level in the very first attempt. There has been a motivation and seeing the rates reach 42% has motivated other candidates as well. The number of students enrolling in December is almost similar to number of students appearing in June. The gap provided by the CFA Institute i.e. of six months has helped the candidates who did not clear the exam in their June attempt to prepare well and clear it in the December attempt. 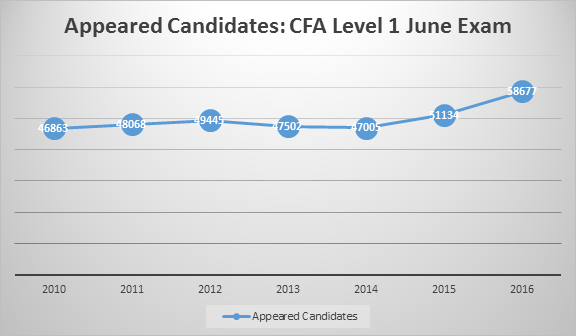 The graph below clearly depicts how there has been an increasing trend in the number of CFA candidates. It has gone as high as 59,000 students in one session. 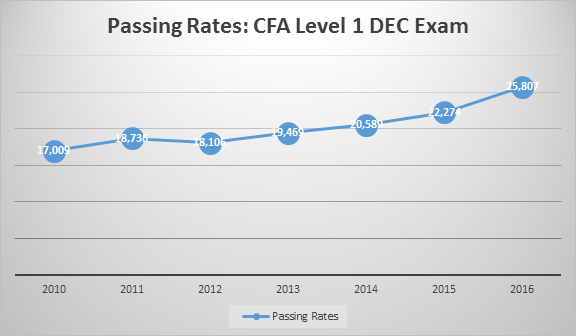 The pass rates for the December attempt has also seen a rise and in most cases is similar to the June attempt. The last two years have seen a higher pass rate in December when compared to the June attempt. The pass rate has seen an increasing trend with a little bump in 2013. With pass rates reaching around 45% has brought hope in the candidates who take up the exams. It’s not long before they hit the 50% bar. 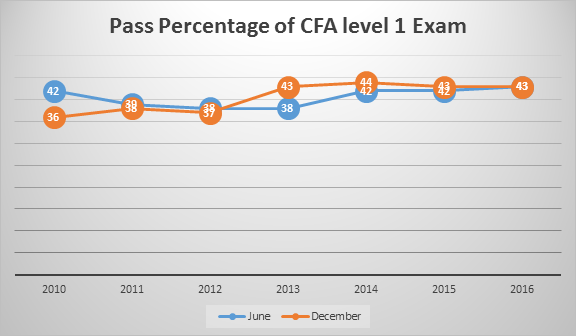 The CFA Level 1 pass rates do seem to fall and droops at places but has seen an upward trend in the long run. 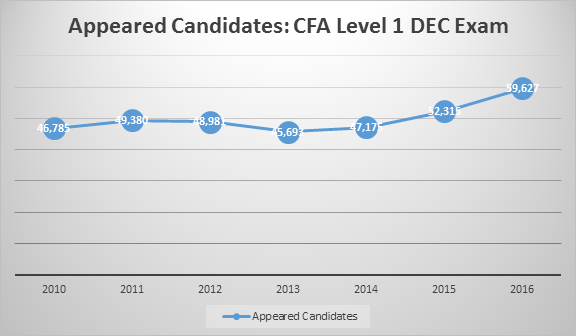 The 2014 December exam has seen the highest pass rate clearly depicting that candidates are striving to clear the CFA Level 1 in their very first attempt. The exams are not very difficult, don’t get discouraged with the pass rates if you put in the right amount of effort you will pass the exams easily. Do you have any query about CFA® Course? Talk to our experts. Want to know more about CFA Course? Talk to our expert career counselors who can guide you about CFA exam, career opportunities and preparation! Myth buster : The passing rate for both the June and December exams is similar. None of them show a significantly higher rate. Visit the CFA myth buster’s page to clear all your doubts about CFA. Prepare well for your CFA exams; you can reach out for help and training by enrolling with EduPristine. All the Best!